Issue XIX Vol. 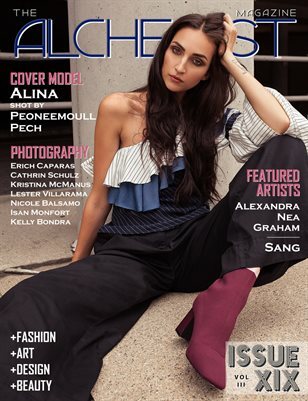 III of The Alchemist Magazine features model Alina on the cover photographed byPeoneemoull Pech. The issue also features photography editorials by: Erich Caparas, Cathrin Schulz, Kristina McManus, Lester Villarama, Nicole Balsamo, Isan Monfort, and Kelly Bondra. Featured Artists: Alexandra Nea Graham and Thieu Dung Nguyen Sang.